It’s no secret that our cats love to go out and explore the world, even when we sometimes don’t want them to! This is why we’ve gathered the best in collars, harnesses, and leashes to help you keep track of them. 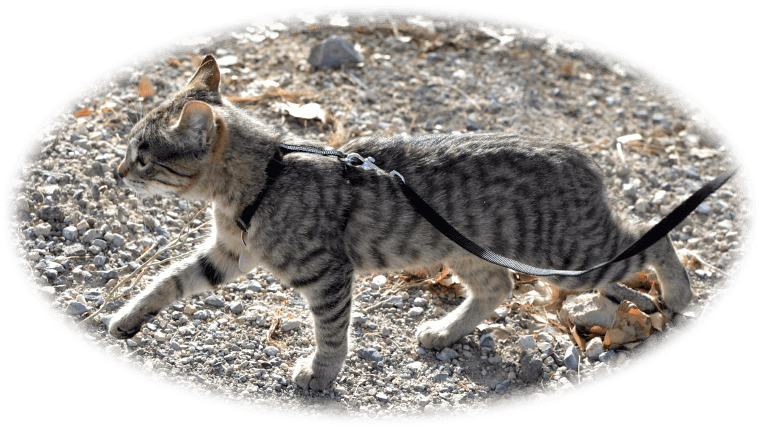 Having a good harness and collar to go with your cat ID tags can help keep your cat safe during both planned and unplanned outings. Always choose quality products with safety features that will prevent your friend from harming themselves during their use. Select from fun patterns of machine washable comfort collars, harnesses and leashes from one of our top-selling brands, R.C Pet Products. These products include specific safety features designed for cats. The Elasta Cat stretch collar from Coastal Pet Products is fabricated from an elasticized braid, and allows complete adjustability as the buckle can slip through the porous material at any spot. The expanding material will keep the collar on when not under stress, but expands to allow your cats release in the case that it becomes entangled. Ensure your friend has the right gear so that you never have to worry about their safety (or whereabouts!). Visit our store in The Beach to pick out the cat collar, leash or harness that works best for your best friend!